Manjit was born and raised in England to Indian Punjabi parents. She started performing sikh hymns and mantras at her local temple aged eleven. Her biggest influences are her parents who were teachers at the temple and the spiritual community of Ramgharia Sikh Temple. As a singer/songwriter she started also recording guided meditations as well as spiritually influenced songs which later led to growing her practice and techniques by experimenting which methods worked best over a 20 year period. 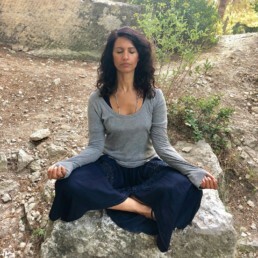 Her belief is that meditation can be incorporated in everyday life using different techniques so that it doesn’t necessarily have to be just a sit-down-in-silence practice. Her private sessions include a palm reading to assess the clients life path followed by a recorded personal guided meditation with proven brain programming techniques to help alleviate negative habits and childhood trauma. Her group guided meditations use nature and the chakras as visualization so the client can use imagery to heal as well as calm the mind/body and connect to ones authentic self. Manjit is currently the NY/NJ wellness and meditation teacher for the Chanel Inc boutiques and specializes in teaching corporate wellness in the luxury service industry. She is passionate about teaching the science behind meditation and the benefits of how when we incorporate different kinds of practice in our daily life, we raise our vibration and are more present and happy in life.